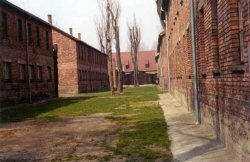 A guide for traveling to and touring Auschwitz. The Auschwitz Camp is the most visited travel destination in Poland. Getting there and touring the camp is rather easy in the sense that the travel route is well developed. But to get the most out of your trip, here are some things that you should consider. Please do take the time to go through them in depth. A trip to Auschwitz is a life changing event. You should be prepared. The camp comes at you fast, hard and strong. Your guide will cover a lot in a relatively short time. You will miss much if you try to absorb it all without preparation. We recommend strongly that you buy some of the books that are available on Amazon and read about the camp before you experience it. Detailed information about how to get to Auschwitz is at The Best Way To Get To Auschwitz. Tours are available at the gate, But! A visit to Auschwitz is a very personal experience. It might not be the best time to be part of a mass of people being lead on a routine group tour. Travel to the City of Oswiecim, where the Auschwitz camp is, is through Krakow. Krakow has the best tourist facilities in the area. Additionally, after experiencing the camp, it is best that you get to a city where there is life and things to divert your mind. In any case, here is detailed information on where to stay. If there is ever a time for peace and quite and the ability to draw into your own inner sanctum, it is when you visit Auschwitz. Avoiding the crowds going and coming to Auschwitz might be best. If you book hotels or arrange tours using this service, you can be transported via limousine. This is no place for children. They are not allowe in the camp. Many times people try to get around this rule. They do not succeed. The camp is too much for children, regardless of how parents think they have prepared them. So that we can provide the most efficient way to deliver information to you, there is a separate page on Auschwitz Tours. Your trip to Poland is likely to be a once in a lifetime experience. So be sure to get the most out of it. There are many other things to see and do.